I’m such a paper reusing freak that I’m just getting around to breaking out one of the promotional notepads I got at last year’s How Conference in Bahstun. So I’m in a meeting with one of our client-partners using said notepad and they exclaim, “what the h@$#ck does that mean?” pointing to the aforementioned notepad. I look down and read what you see above. I initially didn’t see anything wrong with this. But you have to understand the context in which I was first introduced to it. This was a paper mill’s promo item, given to me along with a whole bunch of other stuff, branded to the hilt and accompanied by supporting messaging. 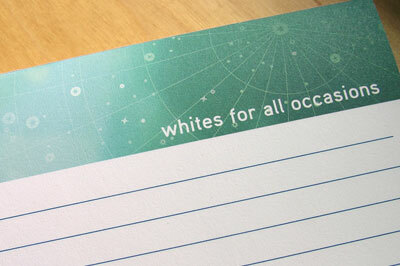 So “Whites for all occasions” seemed like a way to refer to the range of white paper offerings…right? Seeing it through our client’s eyes though… it definitely has other connotations. Now the client we were meeting with isn’t the type to be easily offended, so there was no harm done, and since then I’ve shown it to a few other people who thought it was hilarious. But the incident made me think… suppose we were meeting with another kind of client, one who didn’t know us as well, or maybe was more sensitive about these things than we are? I have to admit that if I was looking at the statement without knowing the context, it might raise my eyebrow… but what do you think?